As the City Market lunch crowd wanes on a recent Wednesday, Scott Meinke chops chives on a green cutting board while his wife Kate methodically cubes butter on a perpendicular stainless steel prep table. This is the Heirloom Bakery & Hearth two-step, where the couple preps and shifts and washes and mixes and watches and moves deftly through the tiny Farm to Table Kitchen. The commissary kitchen has become a second home as the Meinkes have been working on transforming the space at 401 E 63rd St., a former auto repair shop and the future location of Heirloom, since March 2014. “We always wanted to make it a very homey and comfortable spot, but where the design still creates a unique and interesting space,” Kate Meinke says. The Utilitarian Workshop is responsible for creating the look that the Meinkes expect to unveil this spring when Heirloom opens. John Anderson, the co-owner of UW, also introduced them to another client, Thou Mayest Coffee Roasters, where Heirloom’s baked goods have flourished. “The Pop-Tarts have been out of control,” Scott Meinke says of the response at the Crossroads coffee shop and bar. 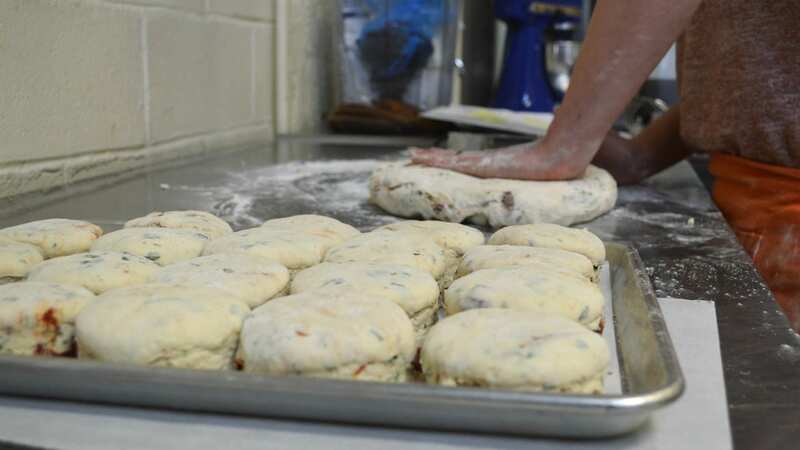 Kate Meinke rolls and wraps the dough for the breakfast pastries, which were also popular sellers during the couple’s first year at the Brookside Farmers’ Market. In months past, they’ve featured apple with cinnamon sugar on top, sour cherry and blackberry Pop-Tarts. The Meinkes have tapped into a vein of nostalgia with Kansas City eaters courtesy of a Friday special at Thou Mayest: pigs in a blanket. Heirloom’s recipes are in plastic-covered sheets in a three-ringed binder that sits open between the couple’s workspaces. Everything is in Sterilite tubs, the kind of clear plastic bins you use to store Christmas decorations and kids clothes. They’ve been bagging and boxing it long enough that Kate and Scott know you can almost fit a 50-pound bag of flour in a 20-gallon white tub. Lifting it is another story. As City Market visitors peek in through the garage doors up front, Scott Meinke works quickly, but gently. Flour dots his apron and sweatshirt. He folds biscuit dough without kneading it before using a metal punch to create pale yellow circles the size of teacup saucers. The couple watches the clock, knowing they’ve still got to bake the several dozen chive and black pepper biscuits and a batch of cookies. If there’s time, they’ll play around with bread. Scott (who worked for the Spring Mill Bread Co. in Washington D.C. for a decade before the couple moved to Kansas City last year) wants to try out a sesame-seeded, sunflower flax bread that he hasn’t quite perfected. “The sunflower gives it a nice nuttiness. It’s very close. It would be perfect with almond butter or peanut butter,” Scott Meinke says. There’s only one 20-quart mixer in the kitchen. When the Meinkes open their bakery in Brookside, they’ll have a pair of 60-quart mixers at the ready. The mixers and ovens were delivered earlier this month. 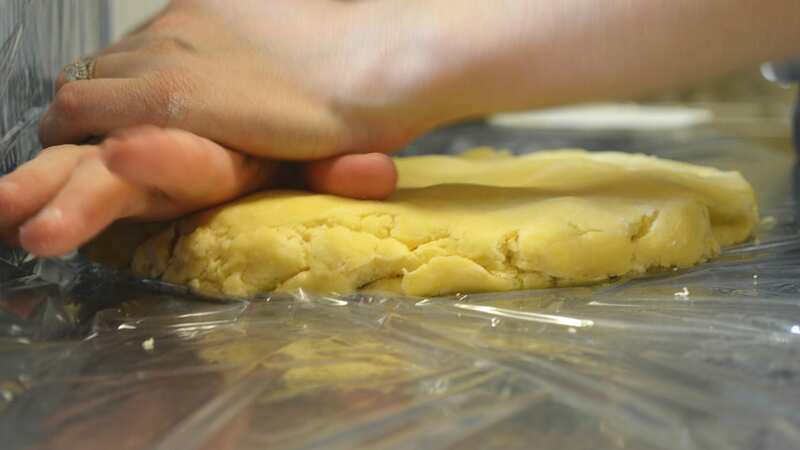 Baking is about precision and routine. They’re at the Farm to Table Kitchen as many as five days a week. They make most of their deliveries on Mondays, shuttling between the City Market and Brookside to keep up with orders and check on progress. “This is our baby,” Scott Meinke says of the bakery’s demands on their time. Even after the bakery opens, the Meinkes intend to operate their stall at the Brookside Farmers’ Market. 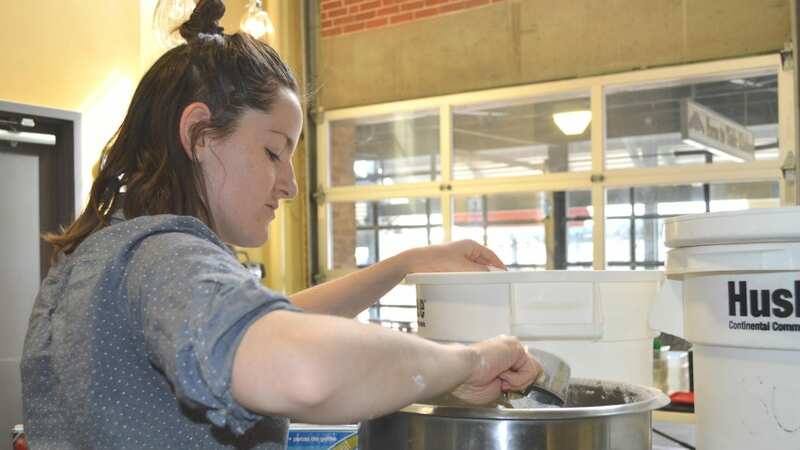 They made cookies, crackers and Pop-Tarts for the market last year; oftentimes, leaving the City Market kitchen just a few hours before the market opened so they could arrive with freshly baked bread. Two hours into what will be an eight-hour day at the Farm to Table kitchen, she grabs a Kitchen-Aid stand mixer. She will use the smaller mixer for a batch of salted oatmeal cookies made with dried cherries and pecans. They’ll fill a pair of cookies with a mascarpone cream cheese frosting for a version of an oatmeal cream pie. “We like to say that everything is perfectly imperfect. We need to embrace it. Some might be a little different, a little bit rustic,” Kate Meinke says. And later this spring, they should finally have a home for those recipes. Jonathan Bender writes about food trends for KCPT’s Flatland, and is the founder of The Recommended Daily.